The Reserve Bank of India conducted the preliminary examination for the recruitment of 610 Assistant to various RBI branches. The prelims paper for RBI Assistant is being conducted in multiple slots to accommodate as many candidates as possible. Here is our detailed RBI Assistant Prelims Exam Analysis as well as Expected RBI Assistant Cutoff based on 23 December 2016 paper. The examination has been scheduled for both today and tomorrow i.e. 23rd and 24th December 2016. The paper review for both Prelims Exam will be updated at each day’s end. The overall level of the paper was Moderate. The paper had a mixed number of easy, moderate to challenging questions, which could be segregated and attempted by candidates with good amount of practice beforehand. 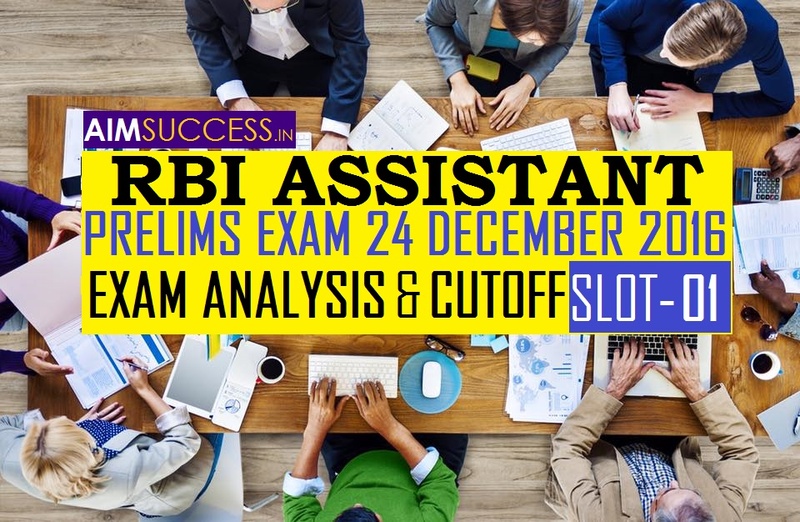 Let us go a step deeper in our exam analysis of RBI Assistant Prelims Paper with section-wise review of RBI Examination conducted on 23rd December 2016. Beginning our paper review of RBI Assistant Prelims Examination, the big surprise, the English Section had aModerate to slightly Difficult set of questions. The topic-wise breakdown of questions is as follows. Based on the challenging mix of questions, we expect an 18 to 20 attempt of questions with good accuracy to be a decent score. The QA Section in RBI Assistant Prelims Examination had a Moderate Difficulty Level, with slightly calculative questions. The topic-wise breakdown of questions is as follows. While the syllogism based questions were easy to solve, most candidates skipped Sitting Arranged questions due to the confusing language. Based on the level of the questions asked, we expect an 22 to 24 attempt of questions with good accuracy to be a decent score. Based on both the level of paper and RBI Assistant Exam Analysis of all slots conducted on 23 December 2016, here are the number of good attempts in RBI Assistant Prelims Exam. The cutoff for RBI Assistant Prelims Examination conducted on 23 December depends on a number of factors, like number of candidates appeared, level of paper and the difficulty level of paper, which we’ve explained in our RBI Assistant Exam Analysis. Keeping all these factors in mind, this our expected RBI Assistant Cutoff for Prelims Examination which was held on 23rd December 2016. We will be back again with our RBI Assistant Exam Analysis for Prelims Paper tomorrow i.e. 24th December 2016. Stay connected for more information regarding RBI Assistant Recruitment 2016.